Not so long ago, being able to click a button and have the goods of your choice delivered to your front door in a day (or less) would’ve seemed like some kind of black magic—but as convenient as online shopping is, it does come with its own set of frustrations and problems. Here’s how to fix the most common ones. To avoid missing deliveries when you’re away from home, get them sent to work instead, as long as your office manager doesn’t mind—just about every retail site out there will let you add a second address for deliveries (it’s under Your Addresses on your Amazon account page, for example), so you don’t have to take time off work to meet the courier. This won’t work for everyone admittedly, but if you’re on friendly terms with whoever runs reception and are only ordering small packages every so often—rather than full luggage sets every week—it’s a much better option than worrying about delivery times and days. It’s also worth considering if you live at a particularly remote or hard-to-find address. If you want to take the more high-tech and more expensive option for catching your deliveries, get a device like the Nest Cam IQ Outdoor ($349) or the Ring Doorbell ($199), both of which will alert you when someone’s at the door, and let you chat with them—whether you’re out in the garden or on the other side of the world. Dropping a few hundred dollars on a security camera might seem like overkill just to make sure you don’t miss your next online shopping delivery, but these devices have got plenty of other uses as well. They can dos stuff like instantly alert you to suspicious activity outside your front door and watch over your property while you’re away from home. 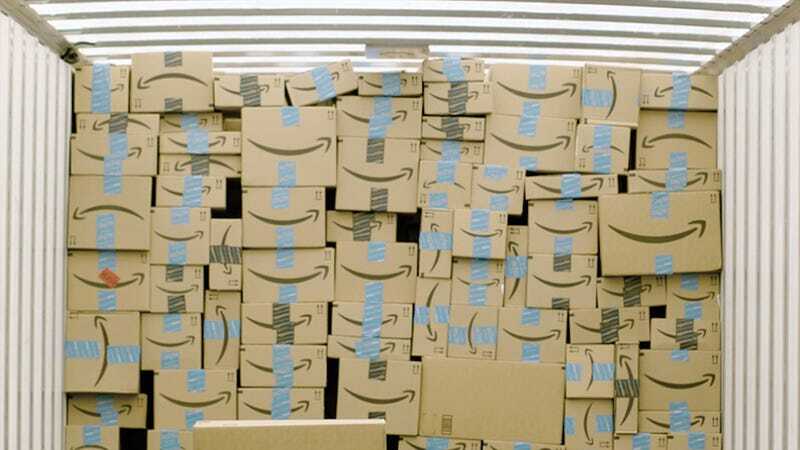 You usually can’t choose your delivery company on Amazon—though picking a premium delivery option sometimes helps—so make sure your package isn’t left on a crumpled heap on the doorstep by picking it up yourself from a local Amazon Locker. You just need to add a local Locker to your list of addresses, and then pick it as the delivery address. Not everyone has a Locker system set up like Amazon does, but a lot of retailers let you order and pay for products online and then pick them up in store—if the store is close to where you live or work, and you really don’t trust the delivery companies to do a professional job, then it’s worth considering (especially for fragile or expensive items). With so many stores offering you the same items, how do you know where your money is going to be best spent? Fortunately, a ton of tools can help: The likes of PriceGrabber and Google Shopping will scour a plethora of different retailers for you, while the excellent CamelCamelCamel concentrates specifically on tracking prices on the Amazon website. Don’t forget your coupon codes either—Honey saves you the trouble of searching for codes and even applies them automatically at the checkout for you, and Piggy does pretty much the same job. Get a few of these apps and extensions to help you in your online shopping and you don’t have to worry about paying a price that’s going to be bettered elsewhere. You don’t have time to sit refreshing the Best Buy website all day, so you can easily miss out on special offers and reductions. This is one occasion when signing up for email lists can actually be useful, at least for a select number of stores—let the deals and offers come to you, rather than the other way round. Maybe use a separate email address for the job. For retailers without a deals email, or with too spammy an approach to their mailing lists, try following them on social media instead. A Twitter follow or a Facebook like means stuff that you might be interested in will pop up in your feed, and in the case of Twitter you can set up a separate Twitter list so your main timeline doesn’t get overrun with special offers. Shop online and you can’t really see what you’re getting until it turns up—you can’t hold the item in your hand like you can in the store. One way around this is to test out something like a phone in a physical retail store, so you know how it looks and feels, before returning to your web browser and searching out the cheapest price for it online. There’s no 100-percent foolproof way of avoiding getting a dud sent to your front door, but carefully read as many reviews as you can—look for what people say about build quality. If you’re buying furniture double check what the furniture is made of. Is it real wood or particle board that could disintegrate in a year? Also check out as many different photographs of the item as you can, and if you don’t get sent what’s being advertised, complain loudly: Retailers are legally bound to send you the product that was advertised, in working order. Run one search for an Amazon Echo, and suddenly the smart speaker is following you all around the web. If you hate this, we’ve written extensively in the past about how to avoid getting tracked as you venture around the web. Embrace privacy extensions for your browser, like Privacy Badger, Disconnect, or Ghostery. Your choice of web browser may well have some options that can help too, so have a check for them—Safari on macOS and iOS now blocks cross-site tracking cookies by default —and even just firing up a private browsing window every time you want to do some online shopping can stop some (though not all) of the advertisements for that new couch you were thinking about following you from site to site. Getting hit by hidden charges you weren’t expecting has to rank highly on most people’s lists of online shopping annoyances, but it’s difficult to guard against, beyond checking and double-checking that you’ve read all the information presented to you—hidden charges are by their very nature not that easy to spot while you’re rushing around sites. Be particularly on the lookout for sales taxes and extra shipping costs, and remember to take these into account when you’re using some of the price comparison tools we mentioned above . There’s no substitute for taking your time and doing your research thoroughly before buying. All you want to do is buy your item already, but you’re met with another huge form to fill out. Well, your browser can help: Chrome, Firefox, Safari, and Edge now include options for automatically filling out forms based on previously entered data (use the embedded links if you’re having trouble with the auto-fill features, or need to change the way they work). Most password managers, including LastPass and 1Password, can keep track of this information for you too, and will even go as far as storing credit card and reward program data for you. If you’re really serious about banishing the chore of filling out forms for good, consider signing up for a password manager service to take care of the job for you. You want your online shopping experience to be a safe one, and sticking to the big name stores is a good way of keeping yourself clear of scammers. Look for sites that connect via HTTPS (showing a green padlock in your browser’s address bar) and that prominently display verified badges from recognized security firms like Norton or McAfee. Don’t buy stuff when you’re on public Wi-Fi, and if you must, use a VPN while you’re doing so. Someone is more likely be monitoring traffic on public Wi-Fi and might catch your credit card info or passwords. While we’re on the topic of online security, all the usual rules apply to shopping sites as they do to any other site—be wary of following links you receive over email, use passwords that are hard to guess and aren’t used elsewhere, and change them often.